LIVE MUVE Show 04/25/11 (abridged). As I walked up to the studio I found the green room abound with little men in handsome blue uniforms. A troop of cub scouts had requested a visit to the Tiny Radio studio as part of their “Go-See” activities. What fun to surprise the boys with some beginner dance moves. Today’s kids don’t experience a lot of dancing in their families. Television and computer games have taken the place of “dancing around” and many kids adopt a sedentary lifestyle early on. Childhood obesity has reached epidemic proportions in the United States. These little scouts are lucky to be able to enjoy the various activities a Boy Scout membership brings. Still, when Tiny asks them about dancing they react with mild bewilderment. With my MUVE dancing games, I want to bring easy dancing back to our kids and families. MUVE dancing is a healthy physical activity disguised as play. 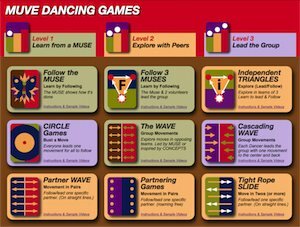 School and family dancing game instructions are available at the muve.com website. There are also many sample videos showing various dancing activity games for groups as small as 3 and as large as 33 dancers. Dancing with a troop of cub-scouts in a small radio studio is a little challenging but never the less exciting and fun. For our second dance we see Allen (4) and Jonathan, a volunteer from the troop.